You may wisely worry about fish consumption during pregnancy because of the risk of mercury contamination and possible effects on your baby. Pregnant women do need to watch their fish intake and limit intake of fish high in mercury. Fortunately, both salmon and tilapia fall into the category of fish with a low-mercury content. You can eat both fish while pregnant, within suggested amounts. Almost all seafood contains some mercury, a pollutant released into the air as part of industrial waste that can contaminate the water. In the water, mercury changes into methylmercury, which accumulates in fish who feed in the waters. Large fish that eat smaller fish and who live longer may have higher levels of methylmercury. While methylmercury doesn't affect most people, it could affect your baby's developing brain. For fish that contain the lowest amounts of mercury, the United States Department of Health and Human Services suggests limiting your intake to two servings or 12 oz. per week. Fish low in mercury include not only salmon and tilapia but also canned light tuna, cod and catfish. Other types of seafood in this category include shrimp, crab, clams and oysters. Fish high in mercury, such as swordfish, contain a mean of 0.87 parts per million of methylmercury, compared to 0.022 ppm for salmon and 0.013 pp for tilapia, the United States Food and Drug Administration reports. 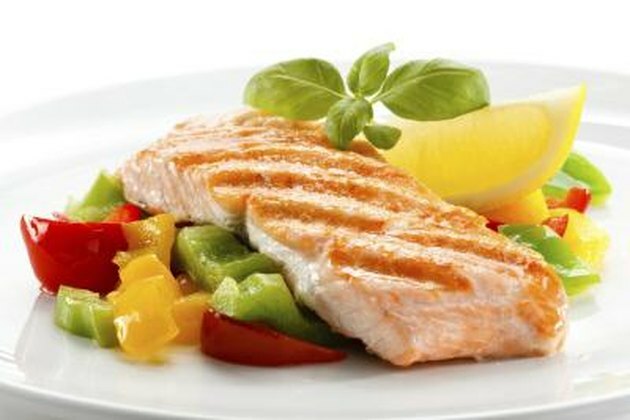 Eating salmon in particular can have positive benefits in pregnancy, because it's a fatty fish. Fatty fish contain more fish oil, which contains essential omega-3 fatty acids docosohexaenoic acid, or DHA, and eicosapentaenoic acid, or EPA. The most common omega-3 fatty acid in the brain and eyes, DHA especially plays an important role in fetal brain development. Tilapia has a lower omega-3 fatty acid content than salmon and a higher amount of saturated fats, according to a study published by Wake Forest University researchers in the July 2008 issue of "Journal of the American Dietetic Association." Farm-raised salmon may not have the same omega-3 benefits as wild salmon unless they've been fed a diet high in DHA, the March of Dimes explains. If possible, choose wild salmon over farm-raised. Farmed tilapia, the most widely farmed fish, according to the July 2008 "Journal of the American Dietetic Association" article published by Wake Forest researchers, has a less favorable fat composition than salmon, since it contains larger amounts of omega-6 fatty acid to omega-3 fatty acids. Omega-6 fatty acids may have inflammatory effects compared to omega-3 fatty acids, which reduce inflammation.